This past weekend, I gave a ~50 minute presentation on the basics of fossils and fossilization. Seen here is the title slide. Between two and three dozen people were in attendance. It was one of three talks at the 45th Annual Central Ohio Mineral, Fossil, Gem, and Jewelry Show in Columbus, Ohio. The show theme this year was “The Fossil Files”. 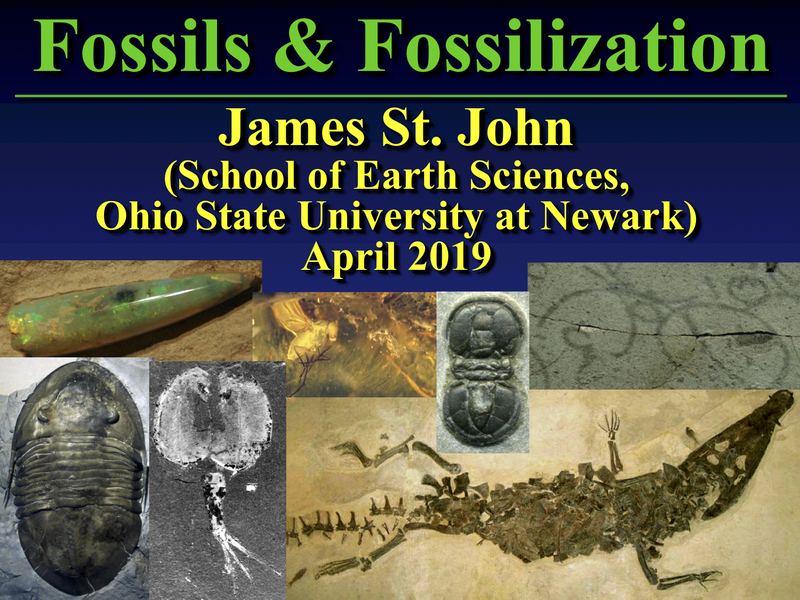 My talk introduced the various categories of fossils (body fossils, trace fossils, and biogenic products), the different fossil preservation styles, and how fossils are named and classified (taxonomy). I also included images of some bizarre and goofy-looking fossil organisms that have been found around the world. I closed with some unusual scientific names that have been applied to some fossils. 1) An insect species preserved in Eocene Baltic amber – “Carmenelectra shechisme”. Someone must really like Carmen Electra! 2) An ammonite cephalopod from the Jurassic of France – “Zigzagiceras zigzag”. 3) A siliceous microfossil from the Eocene of the South Atlantic Ocean – “Adonnadonna primadonna”. 4) A dinosaur from the Cretaceous of Australia, named after Qantas, the Australian airline company – “Qantassaurus”. 5) An agnostoid trilobite from the Middle Cambrian of Bohemia – “Skryjagnostus pompeckji” (just try to pronounce that one). 6) A fossil clam from the Quaternary of Iraq – “Abra cadabra”. 7) A large pterosaur named after an old Central American deity – “Quetzalcoatlus”. 8) An extinct, Tertiary-aged, dog-like mammal – “Arfia”. 9) A polymeroid trilobite from the Cambrian of North Korea – “Bonghwabongia bonghwasana”. 10) A small, phosphatic, fossil “problematica” (= meaning it’s classification is uncertain) from the Devonian of Iowa that is shaped like a rear end – “Gluteus minimus”.